Turnout is often seen as (at least an easy) metric of the health of a democracy – as voting is a primary activity in civic engagement. However, turnout rates continue to decline across many jurisdictions[i]. This is certainly true in Canada and Ontario. From the PsephoAnalytics perspective – namely, accurately predicting the results of elections (particularly when using an agent-based model (ABM) approach) – requires understanding what it is that drives the decision to vote at all, instead of simply staying home. If this can be done, we would not only improve our estimates in an empirical (or at least heuristic) way, but might also be able to make normative statements about elections. That is, we hope to be able to suggest ways in which turnout could be improved, and whether (or how much) that mattered. 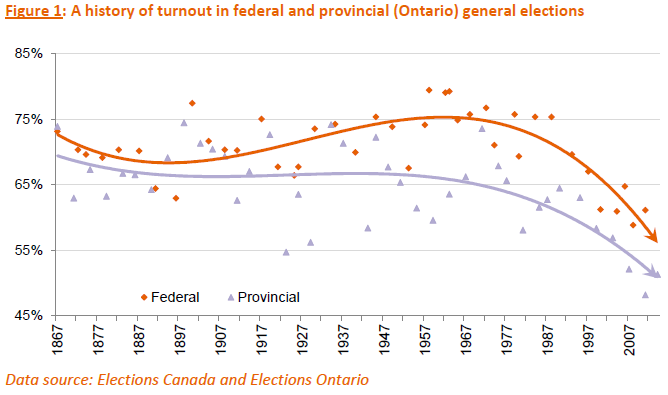 In a new paper we start to investigate the history of turnout in Canada and Ontario, and review what the literature says about the factors associated with turnout, in an effort to help “teach” our agents when and why they “want” to vote. More work will certainly be required here, but this provides a very good start.